If you are looking for an easy and free option to supplement your family time in Golden, some of our great parks and outdoor spaces can add the perfect complement to any day. Aside from taking your family to Splash Water Park or even the Buffalo Bill Museum, why not spend some time in the sun, enjoying our natural landscapes, spotting local wildlife, and showing your children some of the beauty Colorado has to offer. Depending on your family and the age of your children, there are a few different hikes and trails we recommend. 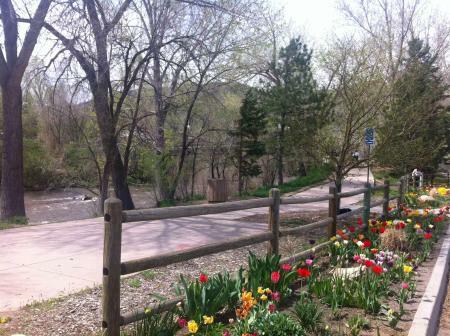 The Clear Creek Trail is one of our personal favorites, offering families a paved trail near the Golden Visitors Center. With a minor elevation game and centralized location, this trail is the perfect mix of exploring while adding on some fun play around Golden proper. The Magpie Gulch Trail is another family favorite, already designed to connect many of our residential neighborhoods and local community schools. Leading to both the Golden Community Center and the downtown area, the Magpie Gulch Trail is ideal for seeing the area, running into some friendly locals, and experiencing our community. Inside the city itself, there are also Lions Park and Discovery Park. Discovery Park offers your little ones the chance to climb on the big dinosaur and brass tortoise or head over to the digging pit and try to find the bones hidden there! With a climbing wall and glass maze, this park offers an adventure for all. Lions Park is a fairly recent addition to Golden, being built in the 1960’s but regularly updated. Home to the Golden Community Center and a large pond, this park is perfect for both play as well as picnics with the family.